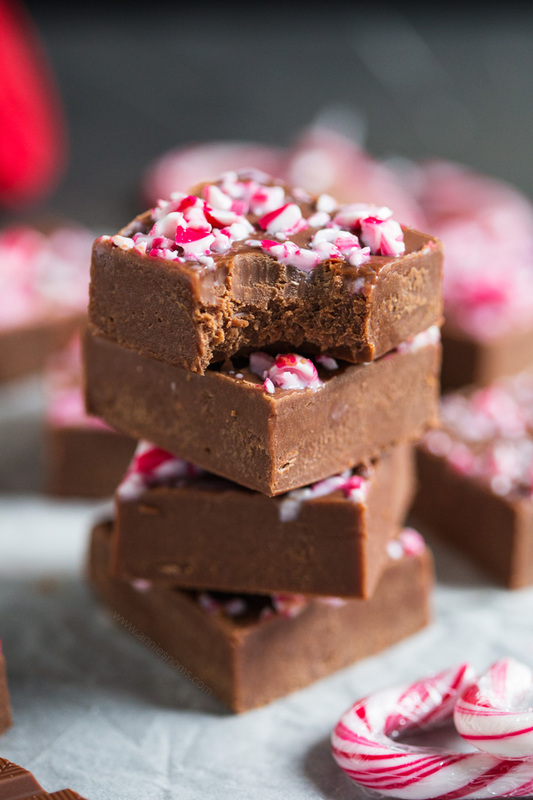 Smooth, chocolatey, filled with peppermint and with a crunchy top, this melt in your mouth Candy Cane Fudge is the perfect edible gift to make this Christmas! 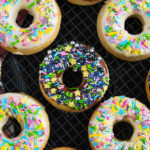 Where do you fall on making edible gifts for people? I see myself as a very thoughtful gift giver. I will spend hours, if not days searching for the perfect gift for someone as I hate receiving gifts where you can tell the person didn’t care one bit and I would hate to be that person. But then, I feel like making someone something edible is thoughtful too as you took the time to hand make it and wrap it up nicely…? 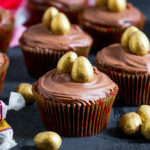 I feel like it’s probably an easy thing to make something delicious if you don’t know what to get someone because I’d rather them have something delicious they can eat, than a present they absolutely hate! So today, I bring you another delicious edible gift idea: Candy Cane Fudge! An example of someone who I sometimes make edible things for because he’s the hardest person in my entire life to buy for: my Dad. He buys whatever he wants, when he wants it, so every time I ask he’s like “I don’t know!” CDs are always good with him as he’s a collector and has thousands and thousands, but sometimes I feel bad that I just buy him the same thing all the time. But then I guess at least he will enjoy them and use them… rather than buying him something he doesn’t like and wasting my money. Every single year a family member buys him a gift and then says “I know he won’t like it, but here it is with the receipt” I just couldn’t be that person. This year, since we are going to Lapland in under 2 months, I spoke to my Dad and said we want to buy you snow boots as you need them and you’ll actually use them, rather than buying him a jumper he’s never going to wear just so he has something to open. He’s an adult, not 5 years old, it’s not all about having loads of presents anymore, it means more to him that I put in the thought to get him something he actually likes. Same with me, I haven’t had my ears pierced since 2001, yet for my birthday I was given earrings from someone close to me who then went onto say “I just go to my drawer and get something out, I never know what I’ve given people” – that’s not something you should be admitting!!?!?? That just makes me feel like you couldn’t give a damn. It would have been OK if the person genuinely didn’t know I had my ears pierced and thought I’d like them, but to say you just got any old thing out of a drawer… there was no thought there and that is the thing that bugs me because it really is the thought that counts. If you’re ever caught in a position like that, I feel like edible gifts are the way to go! Unless you’re like Mr AN and hate cakes HAHA! Being serious for a minute, I honestly think taking the time to make something tasty, wrap it nicely and present it to someone is an incredibly thoughtful gift and I would be so appreciative if someone did that for me because it’s not about how much something costs, but whether someone will enjoy the gift in my eyes. 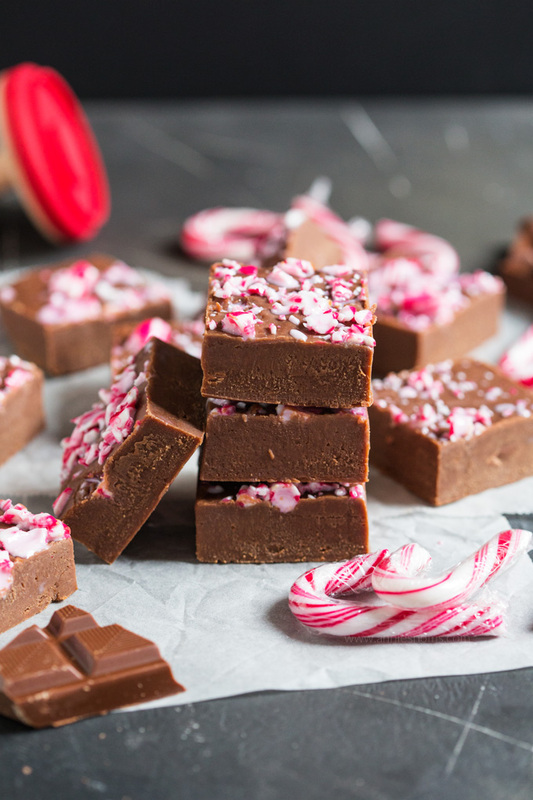 Take this Candy Cane Fudge for instance, easy to make and so unbelievably tasty! I used Belgian Milk Chocolate which is my favourite and cooked it with condensed milk, a knob of butter and some peppermint extract to make the base of this fudge. 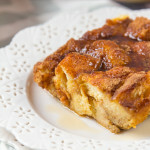 I could not stop eating the melted mixture, it was divine! Rich, chocolatey, yet with a light peppermint punch. After sprinkling crushed candy canes on top, it was ready to head to the fridge to set and become the best Christmas fudge I’ve ever tasted! 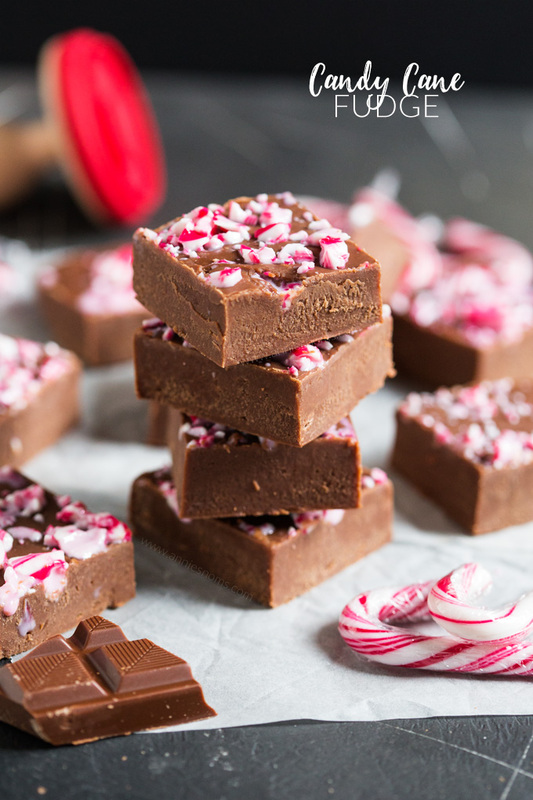 Whether you’re into edible gifts or not, I still think you’d love this Candy Cane Fudge – heck I’d like to keep it all for myself, it’s amazing!! Spray an 8x8 inch square pan with cooking spray and place a double layer of cling film into the pan, with enough overhang to pull the fudge out when its set. Spray lightly with cooking spray, leave to one side. 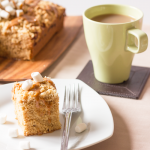 Place the condensed milk into a medium sized saucepan and break the chocolate into small pieces and place in the pan. Place over a low-medium heat and stir until all the chocolate is melted and the mixture is smooth. Add in the butter and peppermint extract and stir until the butter is melted and well incorporated. 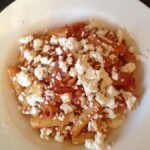 Pour the mixture into your prepared pan and smooth into an even layer. Sprinkle your crushed candy canes over the top and leave to cool for 30 minutes. 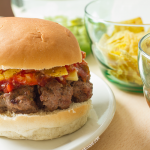 Place in the fridge until fully set, around 2 1/2 hours. Once set, gently wiggle each side of the overhanging clingfilm until the fudge comes loose, peel away the clingfilm and then cut into small squares, around 1 inch square. Devour or wrap up in cellophane bags with Christmas ribbon and a gift tag for the perfect edible gift! Candy Cane Fudge will keep in an airtight container, in the fridge, for 2 weeks. *I used 8 mini candy canes which would be around 4 full sized ones, but you can use as many as you want and cover the whole of the fudge if you want! I left little bits of fudge peeking through the candy cane topping! Sometimes giving gifts is difficult and I too find it challenging. So more and more I go for the DIY baked gifts. 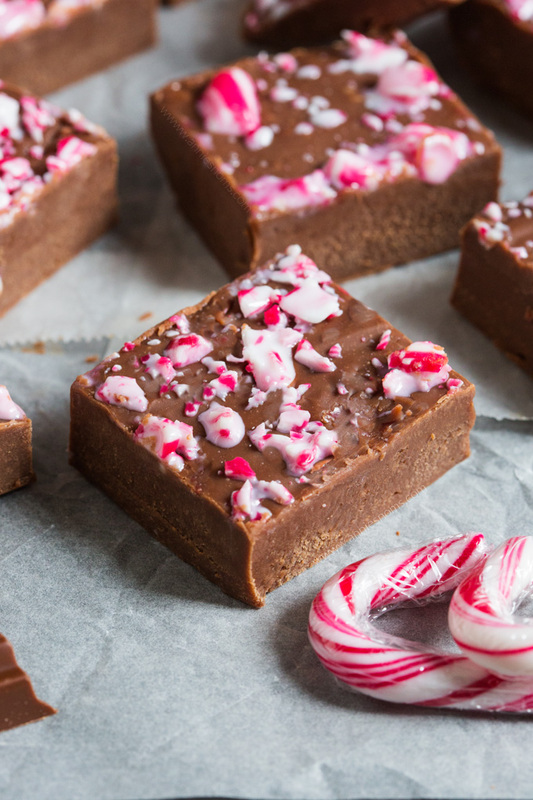 Like this candy cane fudge! It’s definitely a challenge, I feel like it gets harder every year!! DIY is the way to go! Mint and chocolate are two of my favorite things! I know it has to be good! Looks amazing. Mine too, thanks so much! This fudge looks like a totally perfect gift. I wouldn’t mind receiving it. Also… that’s so weird for that person to actually admit that they randomly picked out a gift from a drawer. Bizarre. I’m glad it’s not just me that thinks that’s bizarre lol!! It’s so strange, I would never tell someone that! I still haven’t made fudge this year! That needs to change. I love the chocolate peppermint combo! Thanks so much, it’s such a great combo! I’m a total fudge fanatic. This looks so perfect for the holidays. Same here, it’s the best and it’s so easy as well! I love diy edible gifts. They’re so personal which is always a plus. Plus I’m a huge fudge lover. Wow! I am in disbelief about the answer that the person who gave you the earrings gave you? Like why even bother? I feel that you should only give gifts to people you care about. I never give gifts just for the sake of it. I love edible gifts but I am very picky with food but this fudge I would want to receive! I know, right? I’d rather she didn’t bother if it’s going to be that thoughtless! I like gifting edible things to kid’s teachers. It’s hard to know what they like so, to play safe giving chocolate fudge always gets a thumbs up. Definitely a safe bet! You never know with nut allergies etc. these days! 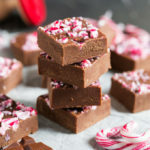 Fudge is always on my baking list but I have never made Candy Cane fudge. 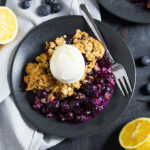 This not only sounds so good but looks so festive I cannot wait to try your recipe. Thanks so much, I hope you get to try it! I wonder if I could break some candy cane into the fudge for crunch? Pinning bc this looks amazing. Yes totally! Just be careful about leaving the mixture to cool for a few minutes before tipping them in otherwise they’ll melt and become a gloopy mess! This Fudge says Christmas Joy! We will love this fudge. Hope you have a fantastic week and thanks so much for sharing with Full Plate Thursday.